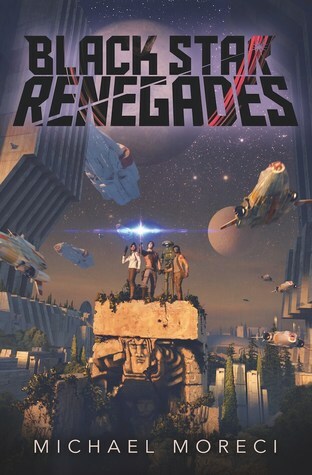 "Black Star Renegades" is a seat of the pants, loads of action, space opera romp. In Michael Moreci's hands, you won't find a technical description of the FTL drive of the star ship. And, I could care less, because this adventure novel packs in all that one wants in space opera. A young hero/savior, with a moody weapon of mass destruction, leads/ cajoles a rag tag revolution against an evil empire of world destroyers and killers. This is not deep thought, but it is big fun. Buckle in boyos and go for a ride. Cade Sura and his older brother Tristan were scooped up off Kyysring, a back water world, home to criminal gangs and extra legal enterprises, when they were youths by Ser Jorken, a Master Rai (think Jedi) from the Well. The Rai are a noble group dedicated to enforcing galactic peace. Fast forward ten years and the universe is threatened by the world destroying Praxis, an empire that has the War Hammer-a star killer machine, that literally eats your star. The Praxis have subjugated planets and destroyed the stars of planets that won't submit. Cade and Tristan are now young Rai's and they have been sent on a secret mission to claim the Rokura, a super weapon forged by the legendary warrior Wu-Xia, that is supposed to be claimed by the "Paragon" who will wield it in a time of terrible tidings to bring order to the universe. Tristan is super brother, the one everyone thinks is best able to wield the Rokura. Cade is the nobody younger brother that everyone thinks is reckless. The Rokura is located in a giant Spire on a world surround by destructive weather and evil Praxis forces. After a thrill of a space ship landing, fights and thrills on the way to the top of the Spire, the brothers reach the chamber where the Rokura is in a status field, but betrayal awaits them as well. Cade ends up with the Rokura, but he is not really the "Paragon" and it is an uneasy alliance between the young Rai and the moody semi sentient weapon. Cade makes it back to the Well with the weapon, where the Masters barely welcome him and immediately the Well comes under attack by the Praxis. Ga Halle, the Praxis evil leader, and her evil special warriors - the Fatebreakers- are there to reclaim the Rokura. Cade joins up with Kira Sen, a fighter pilot and the leader of the elite Omega Squadron to escape the attack. Kira has a plan, she wants to destroy the War Hammer. In the attempt to escape the Praxis, Cade and Kira end up back on Kyysring, where Cade runs into his old friend Mig, an engineering genius, who has befriended a killer robot - 4-Qel. Cade and Mig's reunion is of course, not fun, and throw in attacks by the Praxis again, and the four join forces on the run to head to Mithlador, a mining planet where a super element is located that can help with Kira's plan to destroy the War Hammer. Mithlador is also the location of Percival White, a former Paragon who gave up on wielding the Rokura. The young heroes and 4 Qel meet up with Percival, but the meeting does not go well, shockingly, and the Praxis arrive just in time to mess up Cade’s meeting with Percival. Mig is captured by the Praxis who demand that Cade turn over the Rokura to them in return for his friend, but the heroes have their own plans, and joined by the Omega Squadron and others plot a rude upset to the Praxis plans. There will be plenty of individual fights and Cade will mix it up with a traitor to the Well. And the Rokura will have to act at last. Fueled by a highly readable plot, great action and engaging characters this novel delivers in spades. It’s high fun and big rewards. Don’t miss it.